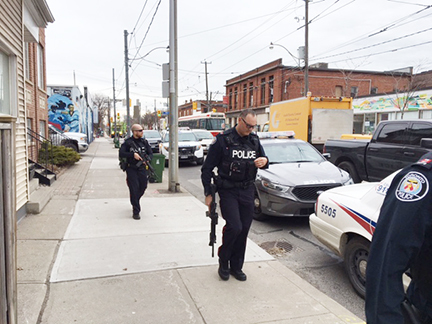 Toronto police officers walk on Gerrard Street East near the Beach Metro News offices on Tuesday afternoon. Police were responding to a call about a person in the area who was spotted with a gun. Photo by Alan Shackleton. There is a heavy police presence in the Main and Gerrard streets area as police respond to a call about a man with a gun. Police flooded into the area at about 1:45 p.m., with heavily armed officers searching streets to the west of Main Street along Gerrard including Enderby Road. The office of the Beach Metro News is on Gerrard Street between Main and Enderby where a number of police vehicles including one from the canine unit had gathered. Other police cars could be seen driving around the area with their lights on. Shortly after 2 p.m., the attention of officers seemed to be moving an area closer to Main Street and east along Gerrard. UPDATE: At about 3:30 p.m., police informed us that the man they were looking for did not have a gun, but a baton. The man’s trail was tracked by a police dog north over the railway tracks from the Main and Gerrard area, but the trail was lost near Danforth Avenue. No arrests have been made in this incident. Police have now left the area, and everything is back to normal.